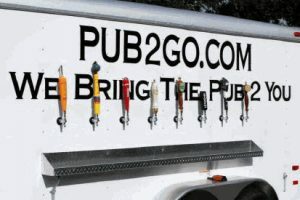 Pub2Go | 603-508-6318 We Bring the Pub to you! We Bring the Pub to you! Perfect for weddings, fundraisers, corporate events, caterers and florists, private parties, emergency cold storage. Accommodates ALL types of brewed beverages, including Guinness and Hard Cider. The perfect complement to any event you are planning. Please keep the power requirements in mind: The trailer requires a dedicated 115v (20 amp) power source. The trailer comes with a specialized extension cord for this purpose, but to use the cord, you must be within 100 feet of the dedicated power source. Additional extension cords cannot be connected to the Pub2Go.com power cord. Use of extension cords can damage the motor in the air conditioning unit (see our terms and conditions). If you are not within 100 feet of a dedicated power source, we have a gas-powered generator that is available for rent.